We’ve just received another report from Flat S! 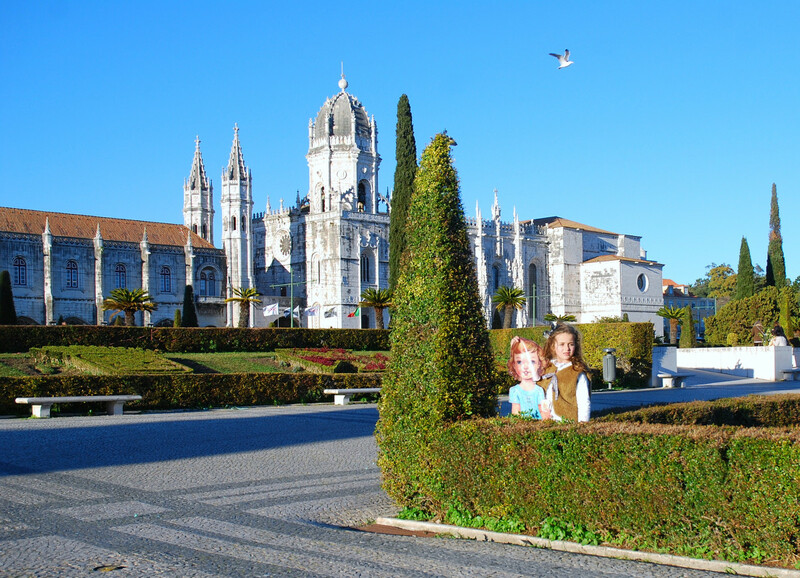 It seems that after she finished her travels around Spain, she decided to stay on the Iberian Peninsula and headed over to Portugal where she had a nice visit with Ana Sofia and family. As always, it looks like Flat S had a great time and experienced a lot of the local culture on her visit. Here’s Ana Sofia to share what they did. Here’s a confession: I’ve been following the Flat S worldwide tour and secretly hoped she could show up someday on our doorstep. My expectation grew as I knew she was spending her summer holidays in Barcelona, Spain (so, so close). Well, after spending a few months traveling around Spain, Flat S decided to make a stop in Portugal and visit Lisbon. She arrived right in the midst of some heavy rain, but I can honestly tell you she was warmly welcomed! I might have improvised some happy dancing steps together with the kids. Obviously, my girl was the happiest of us all; she finally had a roommate! (Thank you so much Liesl, Todd, and Miren for making this possible!). 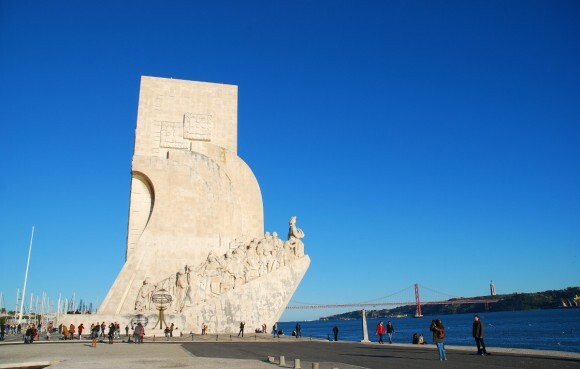 January was not a good month for visiting Lisbon–too much rain, wind and dark skies, kept our guest indoors. She didn’t have time to get bored though. M had all sort of playing plans for her and they were truly inseparable: M taught Flat S to sew with her new sewing machine (or maybe it was the other way around, because Flat S was really good), they had lots of tea parties and they even helped me with the shopping. 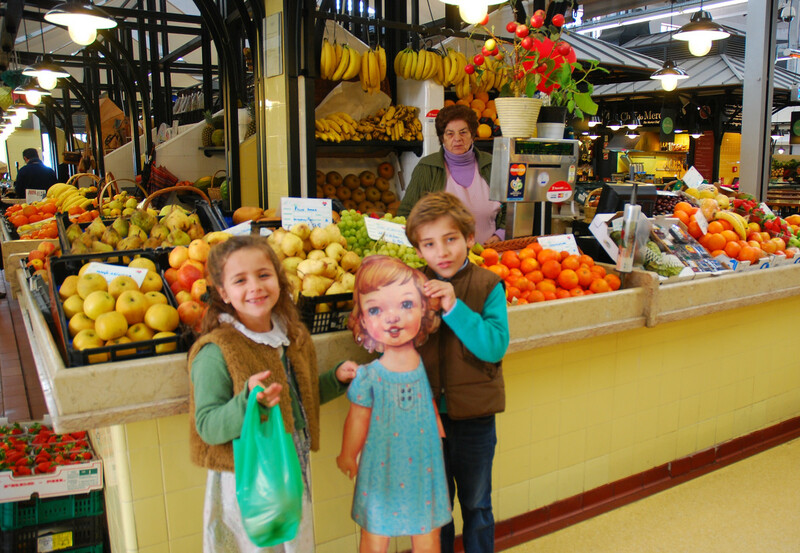 M and G were delighted to show Flat S all the corners of our favorite fruit market – this time they picked strawberries, apples and oranges. Perfect for making yummy kids smoothies and fresh orange juice. As soon as the weather warmed up Flat S was ready to start exploring the city. Our first stop was a tram tour so that Flat S could get a full visit of the city without getting too tired. 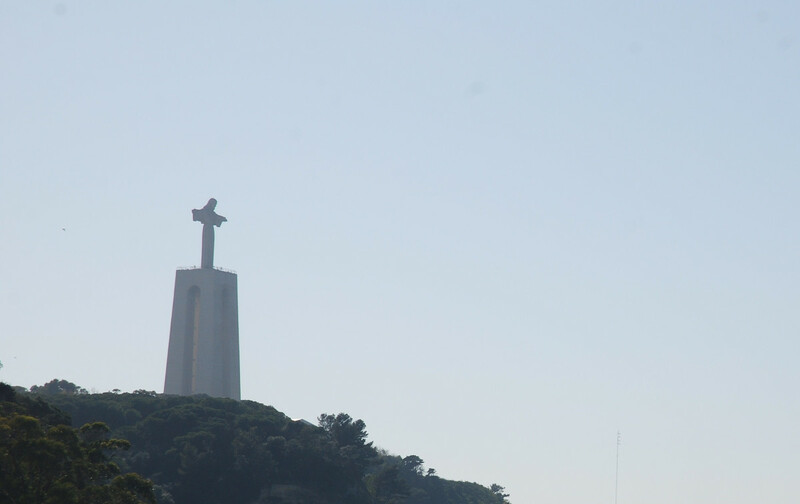 Did you know Lisbon is known as the city of the seven hills? Although the hills give it a special landscape it can be tricky for riding a bike or if you need to carry your groceries up-hill (don’t ask how I know this one). These little yellow trams originate from the 1930’s and are bursting with traditional charm – we all enjoyed our ride so much. 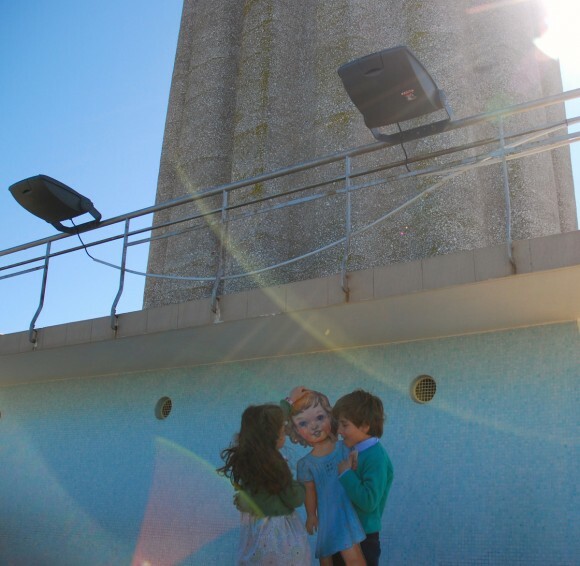 During our ride, we were able to spot the Christ the King statue that overlooks the city of Lisbon from the other side of the Tagus river and the kids (and Flat S) asked for a visit. Luckily, my office is on the other side of the river, so I took M, G and Flat S with me for visiting the monument. They wanted to go all the way to the top of it, but it was so windy up there they had to do their best to prevent Flat S from flying…. Here’s what they saw when they looked up at the top of the statue. 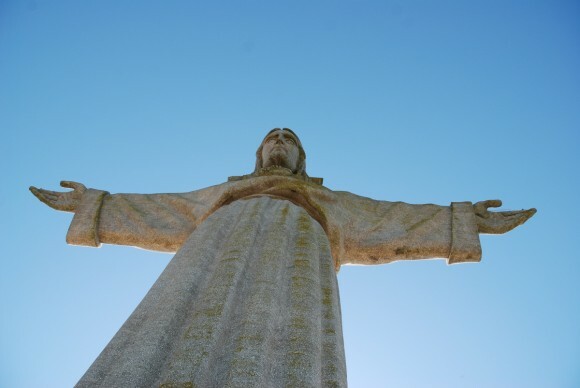 This statue was inspired by the Christ the Redeemer statue in Rio de Janeiro, Brazil and was erected to express gratitude because the Portuguese were spared the effects of World War II (the monument was inaugurated in 1959). 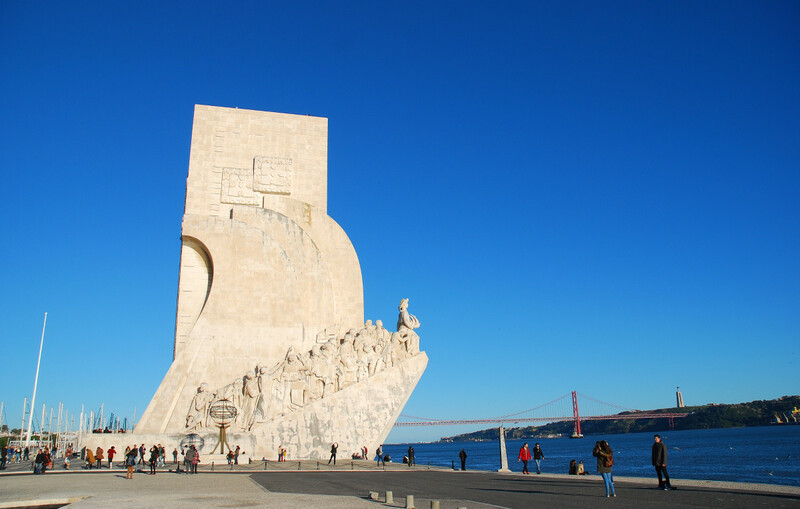 There’s actually so much to see in Lisbon especially if you love history – the city is packed with monuments that showcase our heritage and it has a great climate (a bit windy, but usually sunny) which is also perfect to enjoy its extended coastline. 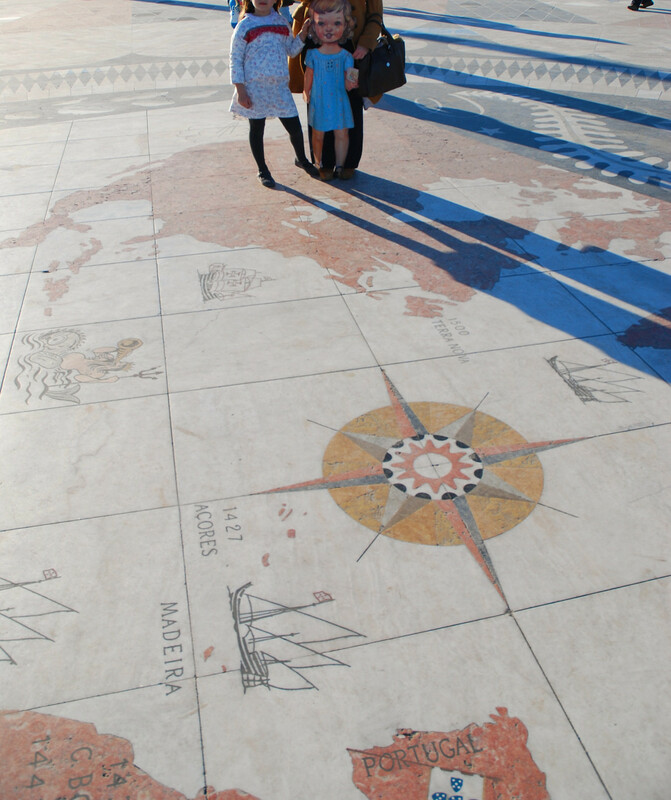 We managed to show Flat S so many of our favourite spots (beach included), but my favourite location pays tribute to the sailors and early explorers that left Lisbon to discover the world. The Belém Tower is a fortified tower that played a significant role in the Portuguese maritime discoveries and was part of a defense system at the mouth of the Tagus River and a ceremonial gateway to Lisbon. 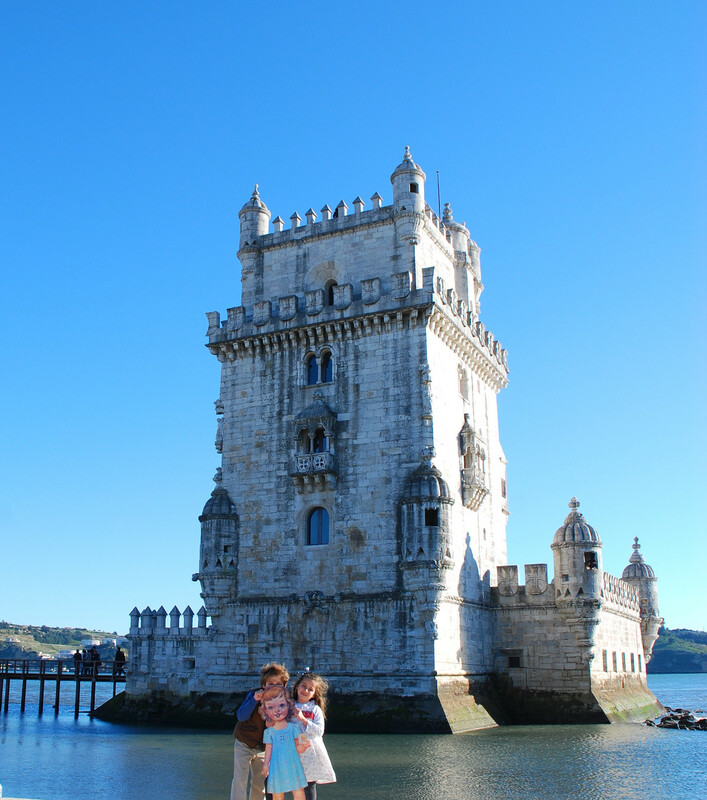 The Belém Tower is a UNESCO World Heritage Site and a visit is highly recommended. Within a short walking distance, we can also find the Monument to the Discoveries featuring carved pictures along its western side depicting the explores and adventures of the 14th, 15th and 16th centuries. It is located along the river in the old harbour where many of those voyages of discovery originated from and ships departed to explore and trade with India and the Orient and it’s now one of our favourite places to enjoy a late winter walk (with lots of sun!). Can you spot the Christ the King statue in the other side of the river? During our walk, we found a tile world map and M and Flat S had fun trying to find their own countries. M and Flat S were surprised to learn that USA and Portugal are only one ocean apart! 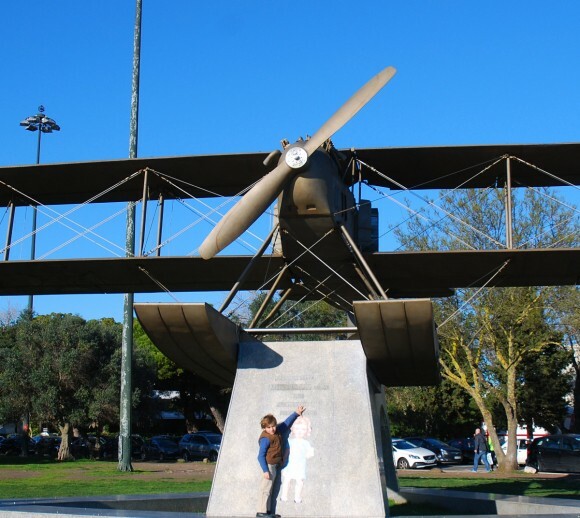 G was obviously not too fond of ships and sailors and suggested that Flat S could fly instead – he’s our “little engineer” and loves the sound of a motor roaring. I’m sure it will be faster but probably not as much fun, right? Our final stop was the Monastery of Jerónimos, which is also classified as a UNESCO World Heritage Site. The construction of the Monastery started in 1501 and was completed 100 years later. It’s definitely one of the most visited tourist attractions in Lisbon and one that you really shouldn’t miss. This monument is historically associated with the early sailors as explorers, as it was from here that Vasco da Gama (the first European to reach India by sea) spent his last night before his voyage to the Far East. Enough about history, as the walking made us all very hungry. Luckily, one of the most renowned pastry shops in Lisbon was just around the corner. We were delighted to savour a few (trust me, you can’t have only one). “Pasteis de Belém”, a sweet pastry originated in the monastery and whose ancient “secret recipe” is passed on and known exclusively to the master confectioners in a “secret room”. The recipe is dated from 1837 and remains unchanged to the present day. Obviously, Flat S loved it. After a few weeks in Lisbon it was time for Flat S to leave. M was not pleased to let her go so it took us a bit of persuading and a little game to help her with this process. Flat S’s new location was selected by a random draw (and I’m not allowed to disclose it at the moment). We loved having Flat S as our guest, and we can’t wait to see what she will be doing on her next stop. Thank you so much for your visit, Flat S! You’re always welcome in our home! Thanks Ana Sofia! 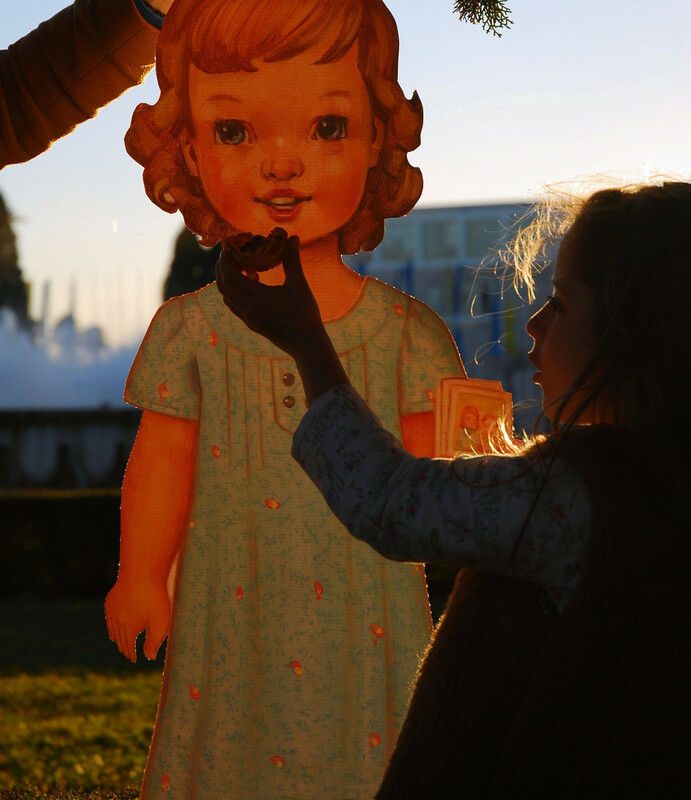 It looks like Flat S had a great time in Lisbon, and we’re excited to find out where she’s off to next. Thank you so much for the visit Flat S (and Liesl, Todd and S for making it possible)!! I loved your post Ana Sofia! Lucky Flat S to spend some time at your home! These travels are the best. I love seeing the world through the eyes of children! Lisbon is such a beautiful city! Flat S made the right choice and with a great tour guide! Loved the post! Congrats Ana Sofia! Lisbon is beautiful! Such a great post! Lisbon is really worth a visit!! 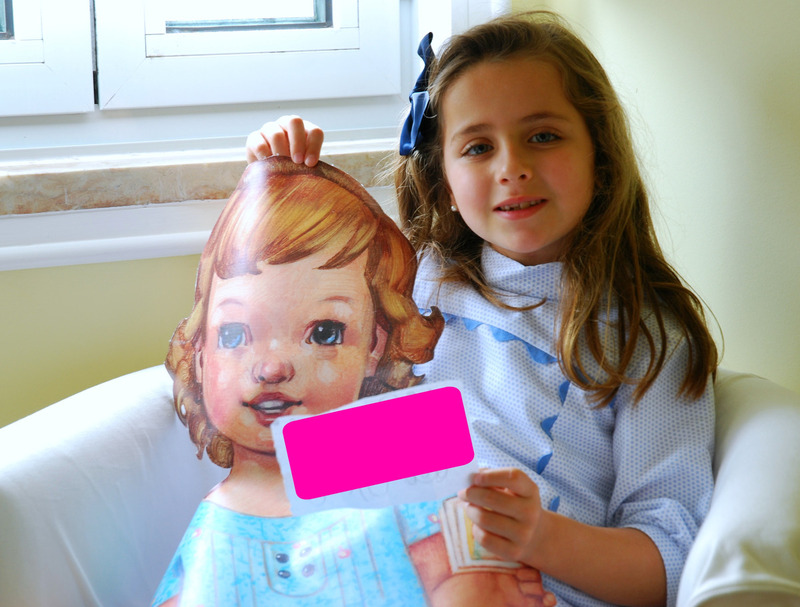 Ana Sofia, i am so glad that Flat S was so welcomed! 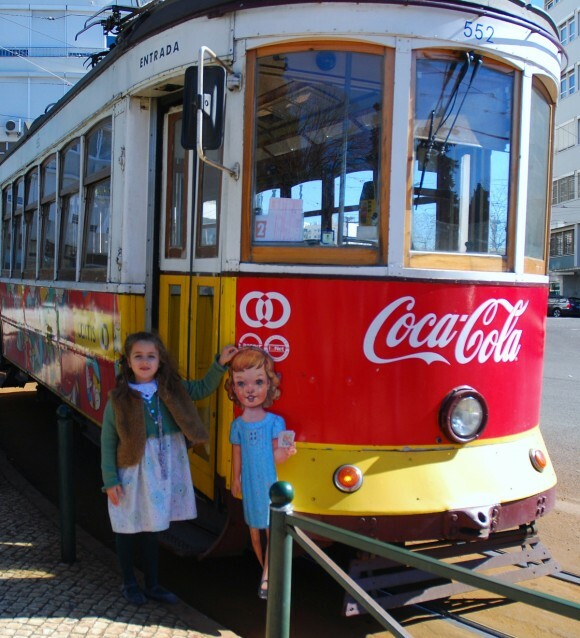 I went to Lisbon with my family aged 16 and I have a real hankering to go again. I remember it as being very beautiful. I think it is often overlooked in favour of Spanish cities, which is a real shame. So beautiful! 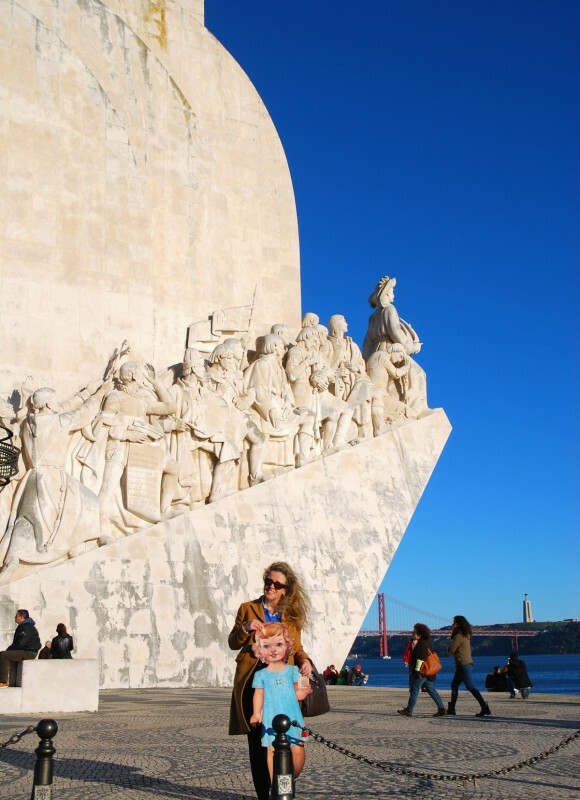 I loved seeing Lisbon and your sweet family.